Milkshakes commonly called shakes are quite similar to smoothies. The two are often confused and the worn name used interchangeably. However, key differences stand out between the two. Smoothies are concentrates mostly made of fruits or vegetables and are generally thicker in texture when compared to shakes. Shakes are concentrated that are normally high in calories and they contain loads of protein. One can get both shakes and smoothies from restaurants of make them in the house using the right equipment and recipes. Smoothies are drinks that are mostly made of fruits and vegetables and don’t contain any milk, yoghurt or ice cream. They are made by mixing up all the ingredients in a blender. The most common ingredients for smoothies include kiwi, pineapple, strawberry or green vegetables. Smoothies are healthy to ingest and it is recommended to be drink them before a workout session. However different restaurants have different recipes of making them . This may make the final product unhealthy based on the ingredients used. Smoothies are usually thick and very filling. They are often taken as a meal supplement or as nutritional requirement. Shakes fully known as milkshakes, are often taken as desserts and loved by sweet-tooth’s. Smoothies mostly contain dairy products and different flavors. They are not taken as a meal supplement, but can accompany meals. Shakes don’t necessarily have a high nutritional value, as they can be topped with whipped cream or candy toppings. Milkshakes can contain a lot of calories and unsaturated fats. Milkshakes date back to the year 1885. However, the first shake was similar to eggnog (whisky, eggs and dairy produce). In the 1900’s milkshakes evolved from alcoholic to the non-alcoholic types. Smoothies normally have lower calories, a lot of carbs and low low fat content. Smoothies are considered to be healthier than shakes, as they are made from real fruit and vegetables. Shakes on the other hand are packed with calories, contain s calcium and can also contain a high amount of saturated fats. Shakes are loaded with sugar, but also contain a lot of protein. Smoothies have been in existence for a while, but it is only recently that they became popular with the health craze going on in the world. Back then it was called Smoothie King. Milkshakes date back further, as their first existence was in the year 1885. People prefer consuming smoothies in the morning. Milkshakes are preferred in the afternoon going on evening. Smoothies are preferred before workouts while shakes after workout sessions. Shakes are often topped up with candy, chocolate sprinkles or whipped cream. Smoothies are often topped with healthy options such as mint leaves, seeds, bits of fruits such as strawberries and nuts. Smoothies hardly contain any protein element in its composition. Shakes are often fortified with protein powder, cream, milk or yoghurt. However, some smoothie recipes involve addition of protein to the drink, this is not often. Shakes mostly comprise of flavors such as vanilla, chocolate, milk, yoghurt, ice cream and whipped cream. Smoothies on the other hand are made from fruits and vegetables. 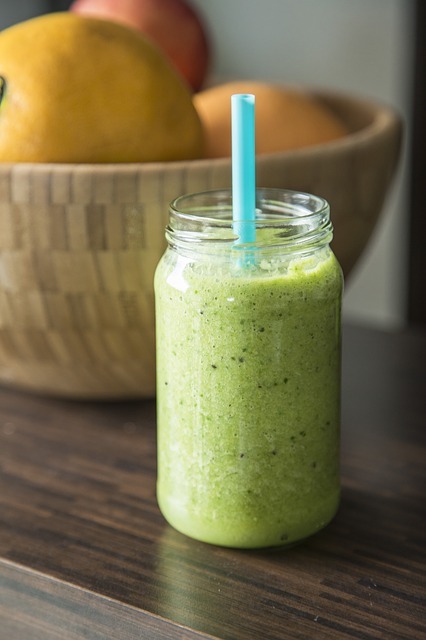 Smoothies are brightly colored and could appear in green, yellow, red etc. Shakes don’t naturally appear in these colors unless there is an addition of coloring. Most shakes are white, pink and brown in color. This factor varies greatly within the two drinks. However, we can establish that smoothies are thicker in consistency. Shakes are a little more fluid and less thick. Different people and restaurants have different recipes which result in conflicting textures of the two drinks. Shakes and milkshakes are great refreshing drinks. They are both mostly served cold. Shakes are much older than smoothies as they date back more than a century ago in the year 1885. Shakes are commonly made from dairy products, can contain flavorings and different toppings. Smoothies are mostly made of fruits and vegetables and often don’t have flavorings, sweeteners or other additives. Most people add honey instead of sugar while making smoothies. Smoothies have less calories and saturated fat levels while shakes can have more calories and saturated fat. Whether you prefer smoothie to shakes of vice versa, both will do a great job in curbing your craving. Evah Kungu. 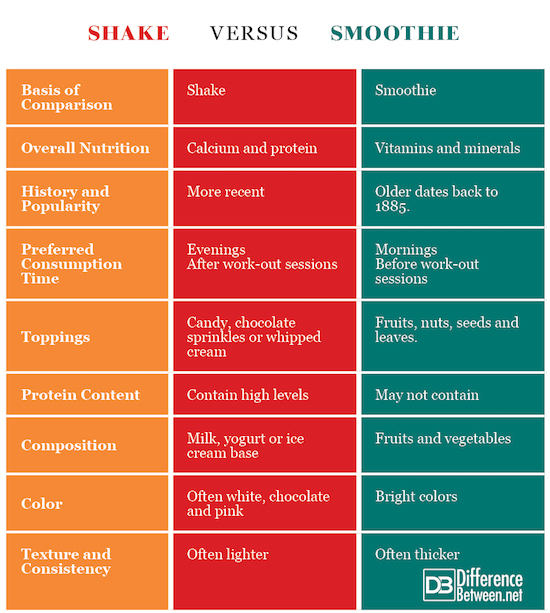 "Difference Between Shake and Smoothie." DifferenceBetween.net. June 14, 2018 < http://www.differencebetween.net/object/comparisons-of-food-items/difference-between-shake-and-smoothie/ >. SHAKES have MAXIMUM calories and saturated fat. PS: While smoothies do have little saturated fat, smoothies are ONLY low calorie IF made of vegetables ONLY. Many people make their smoothies of fruit only and fruit is much higher in calories than vegetables. Also, many people add yogurt to their smoothies adding calcium, protein and calories to their smoothies. Press, Rockridge University. The Smoothie Recipe Book: 150 Smoothie Recipes IncludingSmoothies for Weight Loss and Smoothies for Optimum Health. Callisto Media Inc, 2013. Evdokimov, Alexey. 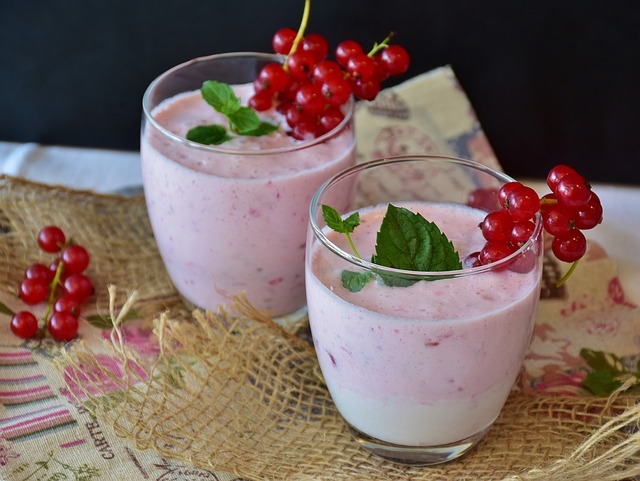 Top 100 Amazing Recipes Milkshakes and Smoothie. Lulu.com, 2016. Ried, Adam. Thoroughly Modern Milkshakes: 100 Thick and Creamy Shakes You Can Make at Home. W.W. Norton, 2012.